‘You Have Reached the Women’ is collective piece penned by Phenomenal women from all walks of life (from Algeria, Egypt, Ethiopia, Mexico, Sudan, Somalia, Zimbabwe and the US). So she can release them in Remembrance deep in the night…. Who will find her passions and create. Pray, love, dance, live, believe. Laugh, breath, swim, write, sing. And sew the holes of society. Without regrets of what was and without fear of what will…. Who is soft-spoken yet outspoken. The one who has often fallen yet never once broken. Human. Muslim. African. Ethiopian. Hareri. Who are you to be extraordinarily fabulous? Who are you not to be?! 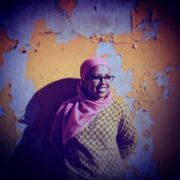 Nebila Abdulmelik is a pan-African and feminist storyteller who uses the creative arts to speak her peace and archive stories of daily existence for coming generations. Born and bred in Addis Ababa, she has since criss-crossed the earth but found her way home again. She is a photographer, poet, writer and editor. Connect with her on her sitealiben86.com and/or on Twitter and Instagram @aliben86. Absolutely Incredible. To be felt, not discussed. Thank You! A Poem to be felt, not discussed. Thankful for the experience!